This is just my speculation, so far, but maybe the I-5 bridge over the Skagit River collapsed because it didn't have enough room for bicycles. Allowed on I-5's wide shoulders in that region, bicycles must exit at George Hopper Road just before narrow I-5 Skagit River crossing. Quite a few posts on social media have been comparing the I-5 collapse to the famous I-35W bridge collapse in Minneapolis, MN. which prompted national debate about our nation's aging infrastructure. Republicans and low tax advocates have come under fire for our crumbling infrastructure, but they'll come back with a defense. "It was an errant truck, rather than poor infrastructure that's to blame for the I-5 bridge collapse." Even though investigation is just starting, it looks like an over sized load hit one of the bridge trusses causing the bridge to fail. Maybe I should say errant trucking company, rather than errant truck. The route must have not been researched properly as the load was prepared for shipping. This is what I can gather from media coverage so far. So, does an over sized load let our infrastructure off the hook? According to an article in Bellingham Herald, bridge was listed as "structurally sound, but functionally obsolete" including narrow shoulders. My speculation is that the truck didn't clear the top girders where they are rounded down toward the narrow sides. If there had been wider shoulders, the fit wouldn't have been so tight. That's my speculation, so maybe one can say, "if there had been shoulder room for bikes, the bridge would have had better clearance?" Bicycles are allowed on many sections of I-5 where there are wide shoulders; especially in more rural areas including most of Skagit County; except the Skagit River crossing, last I knew. The only picture I can contribute to the blog / social media buzz about this event in our region is the "bikes must exit here" sign at George Hopper Exit in Burlington. This is last exit headed south just before the shoulders got too narrow on that I-5 crossing. Most of the time, I use other roads besides I-5 through Whatcom and Skagit Counties anyway. 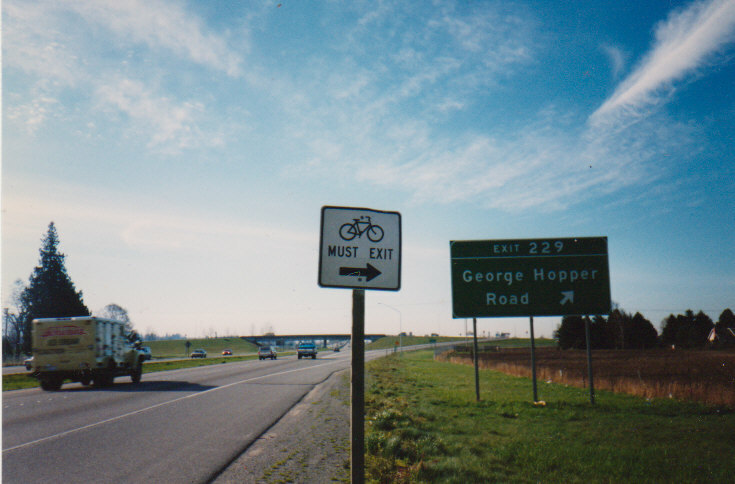 Bicycles must exit and use the Highway 99 "Riveside Drive" crossing. Now it looks like cars and trucks must exit and use Highway 99 as well. Highway 99, has a nice new bridge even though it's not designed for all I-5 and 99 traffic. Another interesting tidbit of history. Steel trusses from old Highway 99 bridge (torn down before the new 99 bridge was built) have been used to construct Depot Market Square, where the Bellingham Farmer's Market is held. Also, though not an afterthought, I'm glad no one was killed. Reminds me of the airplane that crash landed, a few years back, on the Hudson River, in New York, but all the passengers survived. A happy end to that story.